PONTE HEALTH, P.A. 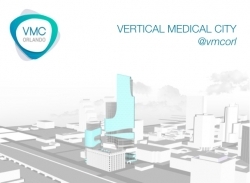 Lead Architect and Founder of VERTICAL MEDICAL CITY is seeking a Qualified and Experienced Architecture Firm to join the Design Team; the project, currently under FAA review and entering Master Planning with the City of Orlando, will contract the selected Firm to help with the Architecture Professional Services of the approximate 2 million SF building complex, for a Start of Construction projected for July 1, 2019. Orlando, FL, February 22, 2018 --(PR.com)-- PONTE HEALTH, P.A. Lead Architect and Founder of VERTICAL MEDICAL CITY is seeking a Qualified and Experienced Architecture Firm to join the Design Team. VERTICAL MEDICAL CITY, currently under FAA review for use of airspace and entering Master Planning with the City of Orlando, will contract the selected Firm to help with the Architecture Professional Services of the approximate 2 million SF building complex, for a Start of Construction projected for July 1, 2019. VMC ORL will be seeking a LEED Platinum Certification. The VMC ORL Design Team, although no firms are yet under contract, includes PONTE HEALTH, P.A., Paul J. Ford, TLC Engineering, Jensen Hughes, Stack Rock Group, The Spinnaker Group, and M2O Technologies.